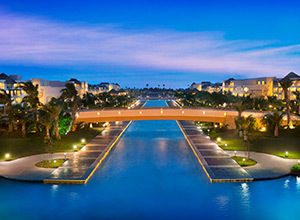 Located on one of the most beautiful beaches on the easternmost tip of Dominican Republic, this all-inclusive property is unique in the region with facilities that include a grand casino, theater, full-service spa, lazy river, and swimming pools for children. Guestrooms feature a double whirlpool, LCD flat-panel TV, balcony, and liquor dispenser. The resort features 11 outdoor swimming pools complete with swim-up bars, non-motorized watersports, a sprawling sandy beach, a kid's club, several shops and boutiques, plus fine dining at many international restaurants and bars, including a sports bar.